Nokia is still hard at work with Nokia Maps; said to be one of the best features on their own devices. 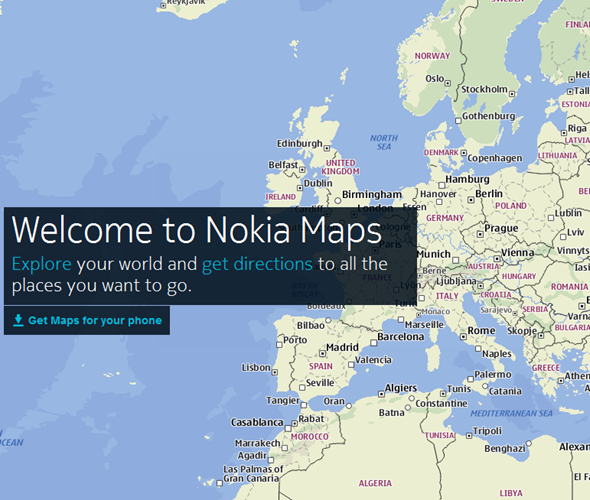 They have now ventured out to bring Nokia Maps to all Android and iOS touting devices out there in the market. Now before you start looking in the Market or the App Store, understand that this is being brought to you via HTML5 on your mobile device’s web browser. Playing around with Nokia Maps, its pretty straight forward. It will ask to use your location and doing so will pinpoint you on the map, its that simple. Once it locates you, you can search for a nearby business by just typing in the name and searching. 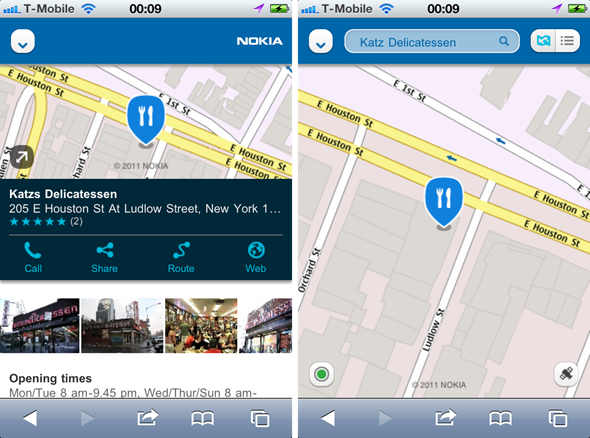 Nokia Maps will find nearby results and list them on the bottom. The map itself will default to the nearest location or you can choose a different one at the bottom of the screen. Once you have the location of the business you desire, you can drop down the arrow in the top left and choose navigate. This will draw a line on the map over the streets you need to drive on to arrive at your destination. You can choose the best route for walking, driving or for taking the bus by touching one of the appropriate buttons on the top left of the screen above the map, Nokia Maps will then tailor the route for you. Then you can choose to save the map to your device to view in an offline state. This will allow you to pinch zoom and see your route without having to necessarily be connected to a cellular network or WiFi. Your map will save locally to your device and when you are ready to use it just choose to use your saved map from the menu. Although I still prefer to use Google Maps on my HTC Sensation, I look forward to seeing the progression of this map service as the first Nokia Windows Phones start hitting the market. I expect to see a possible native app for Nokia devices with OS integration throughout. So, for the time being go check it out and see how well it works for you! Simply open this post on your Android or iOS device and open this link and you’ll jump straight into Nokia Maps.